Added on December 3, 2014 by Todd Yeomans. Please consider making a generous tax-deductible contribution to the Urbanite Theatre's KickStarter Campaign. This will be a great asset to the downtown Sarasota community! Added on October 6, 2014 by Todd Yeomans. Construction on the new Urbanite Theatre is coming along well and we're all looking forward to the next party later this month to tour the shell of the space. 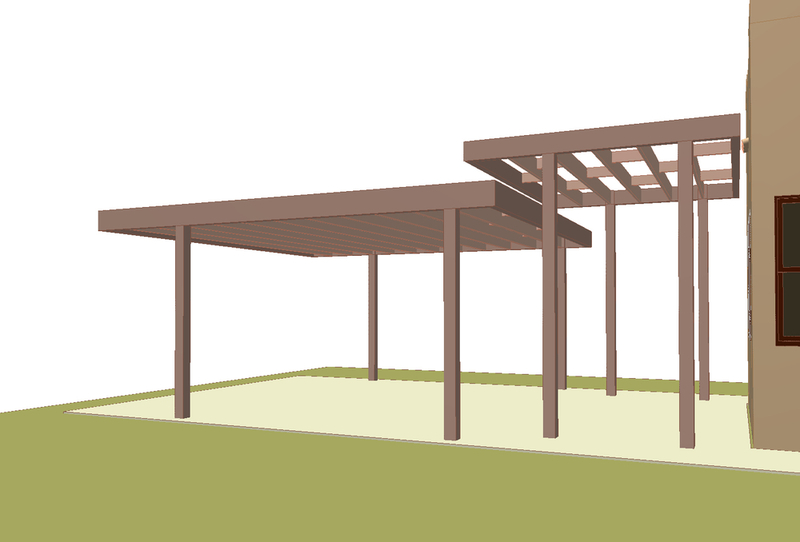 We should have roof trusses and a roof deck up by the end of the month! Summer Wallace touring the construction site. Rendering of the new black box theater I designed recently. The strong pattern to the right is a placeholder for a future wall mural currently in the design phase. Added on April 16, 2013 by Todd Yeomans. Clients with a double-width lot wanted a simple outdoor trellis space to enjoy shady afternoons. I sought to design a space that provided a clean solution that doesn't compete with the existing structure and without the "frills" usually associated with the notion of a trellis. In order to avoid the typical cross-bracing diagonals and the multiple layers of framing members resting one on top of the other, my structural engineer and I worked carefully through the details in order to create two simple planes stepping down from the house to the site. Shade and shadows shown here are based on Sarasota's latitude and longitude, as they will appear on a summer day at 1:30pm. Added on November 26, 2012 by Todd Yeomans. The concrete sink was poured after samples were made. We went with a warmer color that works well with the natural light and cypress trim. White concrete provided the warmer color we were looking for to complement the other finishes. Added on August 22, 2012 by Todd Yeomans. The formwork for the concrete sink is taking shape now. The "negative space" of the sink was made as a box, then needed to be patched and sanded to create a smooth form. The shape is being laid out on an enormous piece of glass to provide a smooth surface when it is released from the mould. The wedge-shaped box will create the void of the concrete sink. The sink void has been patched and sanded. The edges of the sink formwork are securely clamped to a giant sheet of glass to create perfectly straight and square edges and provide a very smooth surface from the beginning. Added on August 3, 2012 by Todd Yeomans. 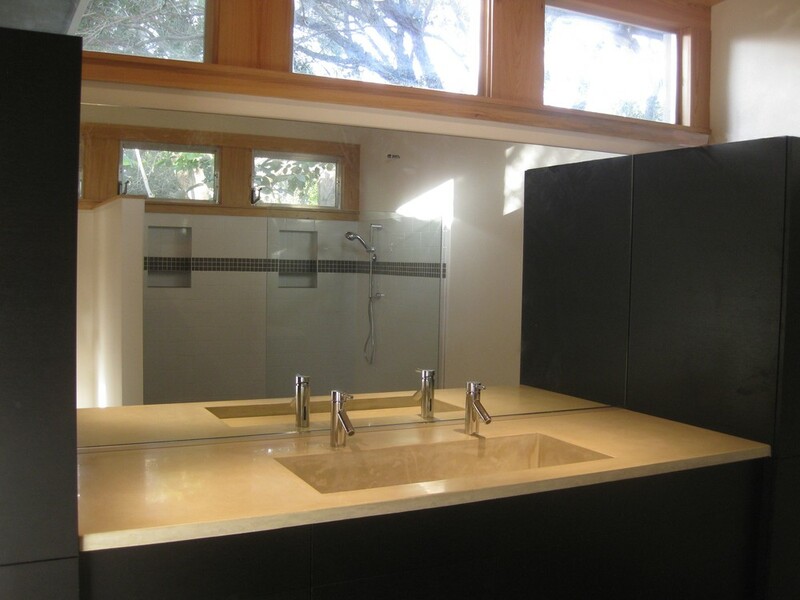 ​The existing master bathroom of this modest mid-century modern on Siesta Key needed an update. Collaborating with a concrete specialist, we are providing custom millwork with a countertop in which the lavatory will be formed into the top.